Arugula, also known garden rocket and rucola, is one of the nutritious green leafy vegetables of Mediterranean origin belongs to the same family of vegetables like a broccoli, kale, and Brussels sprouts and have similar benefits. It is packed with vitamins, minerals, and antioxidants. It is a good dietary choice for a healthier body and keeping your mind clear and focused. Let’s see some of the amazing health benefits of Arugula here on this page. As in other greens, arugula too is one of very low-calorie vegetable. 100 g of fresh leaves hold just 25 calories. The consumption of arugula is a deterrent to cancer because it has lots of phytochemicals. Phytochemicals are substances like thiocyanates, sulforaphane, or indoles. Studies have shown these to be very successful in countering cancer-causing tendencies in the body’s own processes, helping to fight prostate, breast, cervical, colon, and ovarian cancers. Leafy greens contain an antioxidant known as an alpha-lipoic acid that has been shown to lower glucose levels, increase insulin sensitivity, and prevent oxidative stress-induced changes in patients with diabetes. Vitamin K is needed for bone health; it is needed for the absorption of calcium into the bones and teeth. A Half cup of arugula contains 10.9 micrograms of vitamin K. Three cups of arugula daily will supply you with 100 percent of your bodies need of vitamin K.
Arugula leaves contain adequate levels of minerals, especially copper and iron. In addition, it has small amounts of some other essential minerals and electrolytes such as calcium, iron, potassium, manganese, and phosphorus. 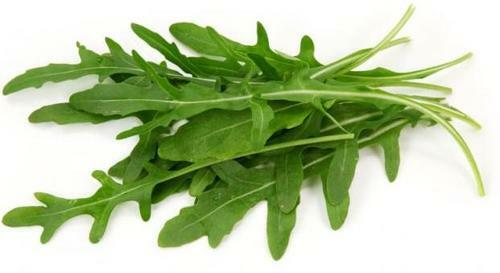 The fibre content in arugula leaves helps to clean out the colon promoting healthy bowel movements. The phytochemicals, antioxidants, and essential minerals found in it help cleanse out toxins in the body.